China is driving down a new road, emerging at the forefront of the NEV market. China has rapidly emerged at the forefront of the new energy vehicles (NEV) market — not by choice, but by necessity. As the largest carbon emitter in the world, lowering energy emissions from transportation is a core part of its war against pollution. The Chinese government mandated that by 2025, one out of every five cars sold in China must run on alternative fuel. Transportation accounts for 10 percent of China’s greenhouse gas (GHG) emissions so transforming this sector could have an important impact on reducing the country’s carbon emissions. Beyond the production mandates, innovative green finance mechanisms could be applied to NEVs, or electric car sales to encourage the intended results of promoting sustainability. In the past three years, China has emerged as a trendsetter in the growing field of green finance. Since China launched its green bond market in late 2016, it has grown to be one of the world’s largest at $36.4 million. The national carbon market, established in December 2017 with trading in just one industry — power — has already eclipsed the European Union’s carbon exchange in operation since 2005. China added green finance to the agenda of the G20 under its leadership in 2016 to help create the international framework for sustainable finance. Yet it is in the practical application of this innovative financing where we can see the most immediate effect. China entered the global market too late to be an effective competitor in the in traditional auto manufacturing, but it has leapfrogged this slowing industry to lead the development and manufacturing of NEVs. Just last year, manufacturing grew by 53.8 percent. It has accomplished this growth through a combination of government policy, and financial incentives, a potent combination that increased both demand and greater production of electric cars. On government policy, the Chinese leadership has made environmental protection one of its top three priorities for the next five years, and development of the NEV market is an essential part of that strategy. Electric cars are seen as an important part of reducing GHG emissions, but even more importantly, are an important part of China’s efforts to champion domestic manufacturing in leading edge technologies. In addition to becoming a leading NEV manufacturer, China is also a leader in the manufacturing of the all-important battery packs that power certain NEVs. The Chinese firms, BYD and CATL, are two of the top five global manufacturers of the lithium batteries required to power these electric vehicles. Policies at the local level have also made a difference. In an effort to reduce smog in Beijing, for example, the mayor of Beijing has instituted a quota system for license plates to limit traffic congestion, with an annual increase in the number being allocated to NEVs. This year, the city will issue more plates to owners of electric cars than traditional vehicles. Shanghai is also following suit so it is no surprise that NEV usage is rising in these major hubs. 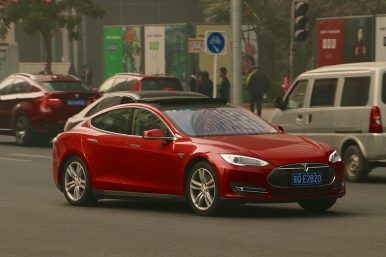 Domestic consumers were originally skeptical of electric cars, and it was not until the Chinese government launched a program of green finance — in the form of subsidies for their purchase — that the NEV sales started to rise. These subsidies come in two forms: national and local. At national level, electric cars with a range of over 250 km on a single charge were able to receive subsidies up to 44,000 yuan (around $6,500) with a purchase. At the local levels, authorities could provide up to 50 percent of the national government grant. In Beijing, for example, subsidies could reach over 60,000 yuan (around $10,000). Given the rise in purchases of these energy-saving vehicles, the government has decided to phase out these subsidies by 2020. There was an initial concern that NEV purchases would drop as a result, but early indications are that sales will continue to rise. However, in order to maintain that growth, manufacturers have cut prices. BAIC expected a 60 percent drop in profits in the first six months of 2016, for example, as it was one of few major electric car manufacturers to lower their prices in response to the phase out of subsidies in order to maintain sales. BAIC saw their NEV sales double in the first six months after the subsidies were reduced as a result of their price reduction. Electric vehicle usage in China has hit a tipping point. While not solely related to green finance, it has played an important role in driving behavioral change leading to the overall rise in electric car purchases – as well as the dominant role that China is playing as a manufacturer. Clearly, in the case of NEVs, it demonstrates the important role that green finance can play in supporting goals to achieve greater energy efficiencies and reduction of China’s carbon footprint. Deborah Lehr is Vice Chairman of the Paulson Institute and CEO of Basilinna, a strategic consulting firm.